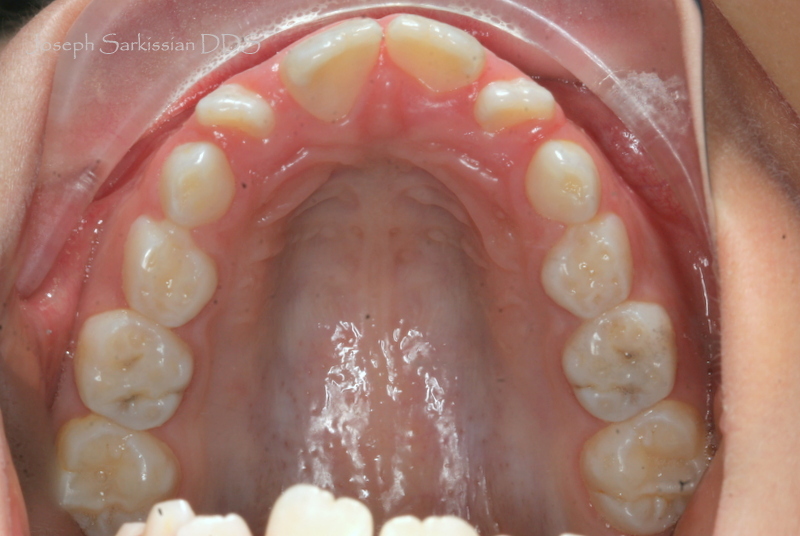 CM, a beautiful 10-year old girl, had an anterior open bite, caused by a tongue thrust disorder. The main reason for this disorder, what many practitioners fail to realize, is a small jaw and arch size, and a small airway, which prevents the tongue from resting in its proper position on the palate. 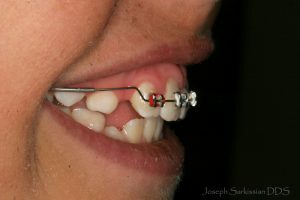 Every time the child swallows, the tongue pushes forward between the teeth, and prevents them from growing down and meeting each other. 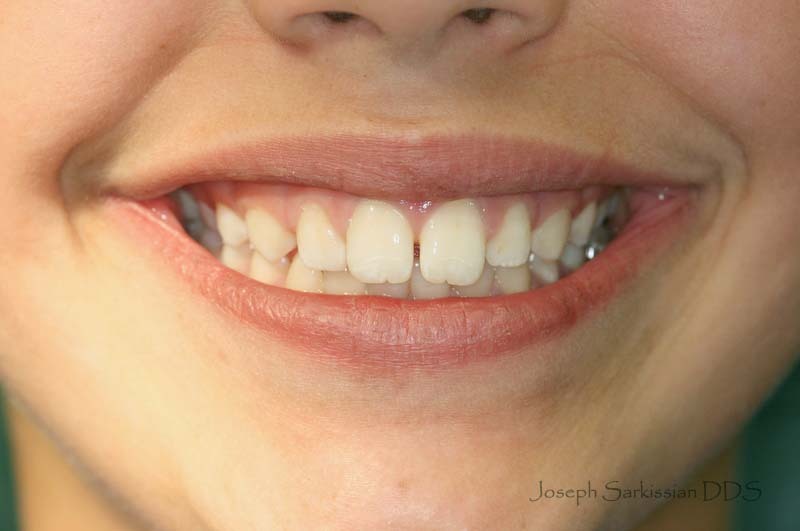 Most of the time the front teeth come in crooked. The lateral incisors are flared sideways, which is an important sign of canine crowding, or basically that there is overall crowding of the arches, and the canines, being the last teeth to erupt, will be displaced as they erupt. 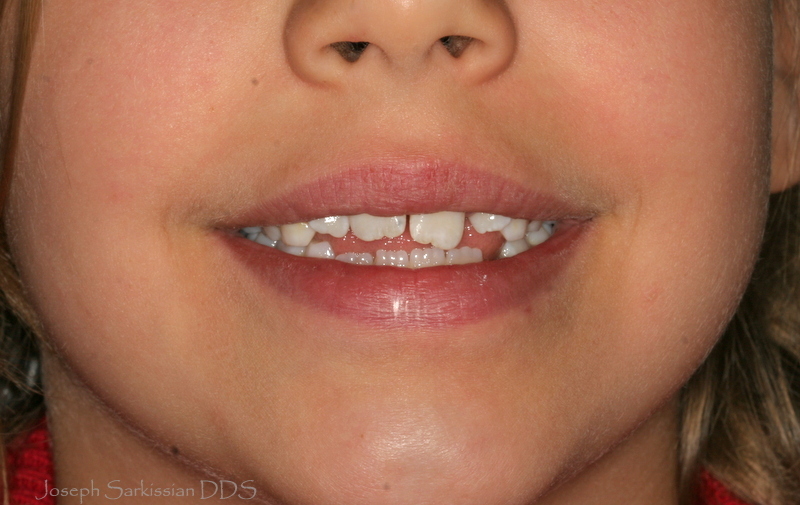 In a child with no tongue thrust, the front gap would not exist. 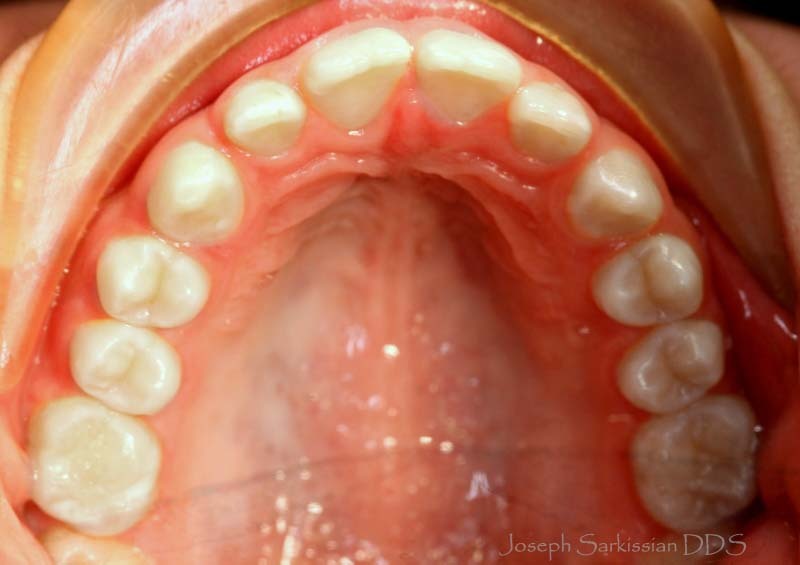 The dental arch: even though here it may appear well-developed, there is a constriction in its size. In understanding the principles of Functional jaw orthopedics, proper jaw development should result in a wide, U-shaped, Roman-arch shape, which should allow for a comfortable fit for the tongue in all its functions. The first step was to encourage arch development with a removable appliance. There is misconception that the bone “expands”, however this is not entirely true, as the growth happens through bone deposition and remodeling rather than expansion. 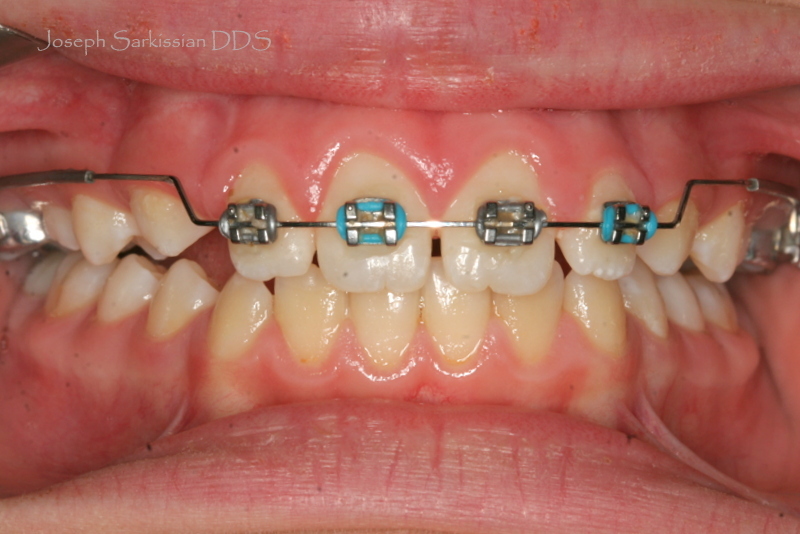 After 3 months, the arches have been developed as testified by the gap that appears in the middle of the appliance. 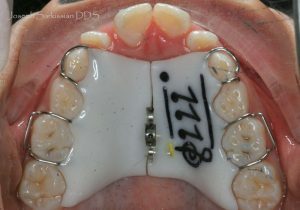 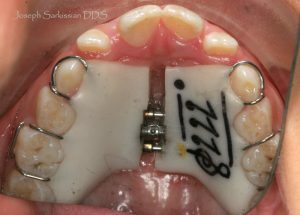 A second appliance is made which continues the arch development, but this time with a tongue crib which prevents the tongue from pressing through between the teeth and allows the open bite to close naturally. 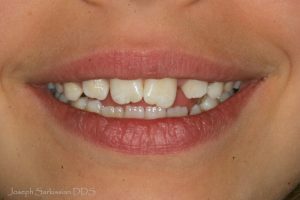 At the end of the development phase the gap has significantly closed up, but the teeth are still crooked. 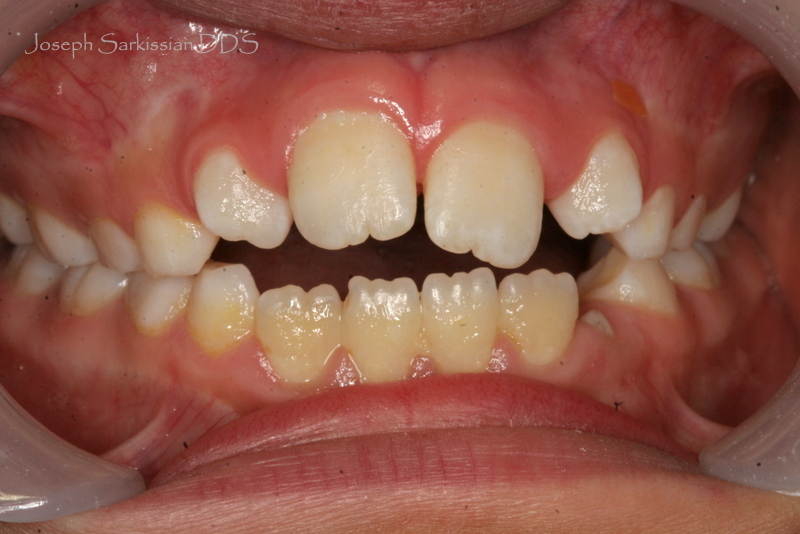 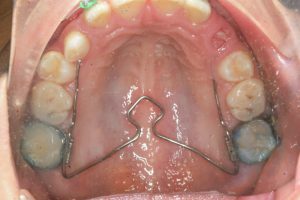 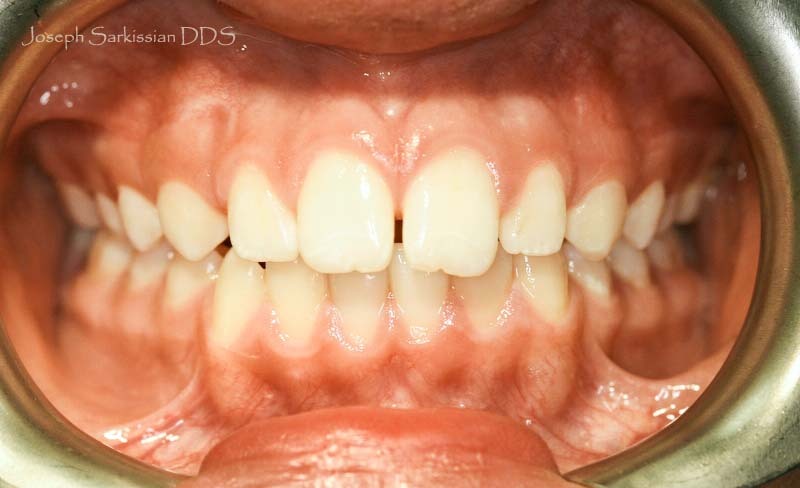 The fixed phase: a wire expander is placed with bands on the upper molars, not as much to expand but more to hold the expansion and to act as an anchor to align the front teeth. 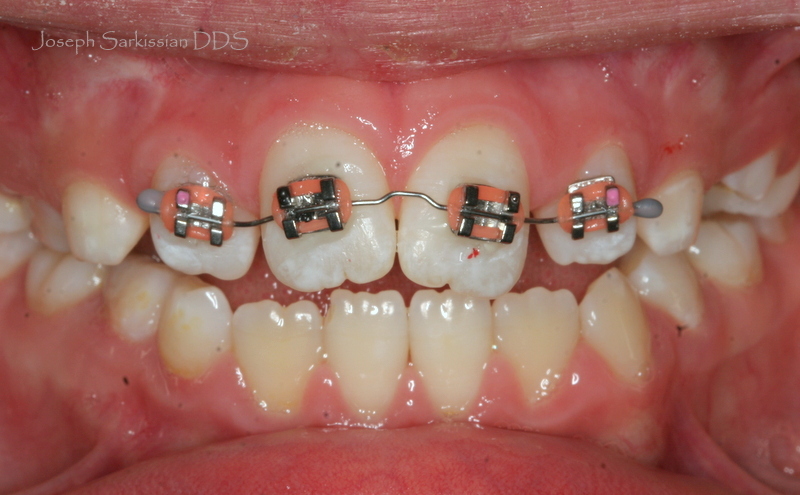 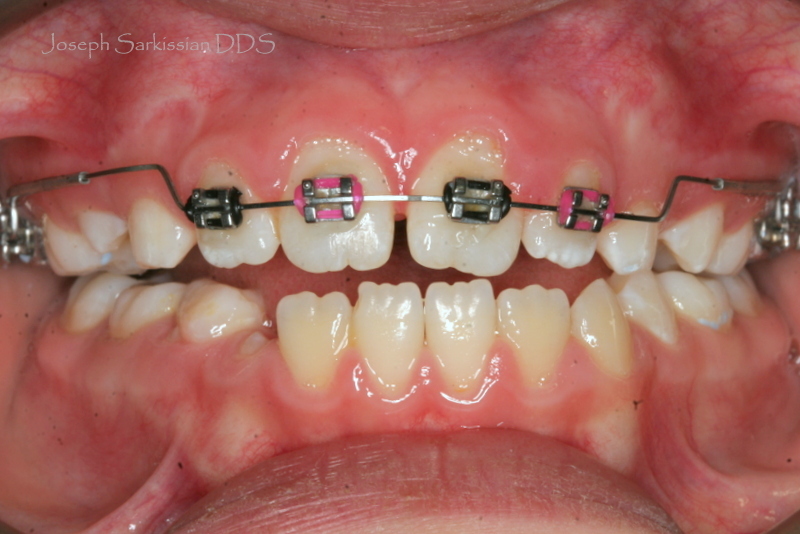 Brackets are placed on the front teeth only and a segmental wire is used to gently straighten them. 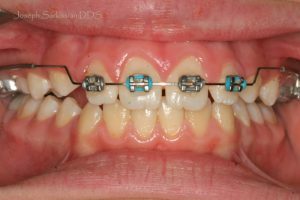 After they straighten, a “utility arch” wire is used to continue straightening, but also to move all four incisors down into ideal position over the lower incisors. 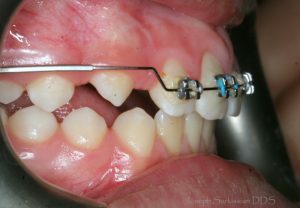 The incisors are brought down into ideal position and the open bite is eliminated. 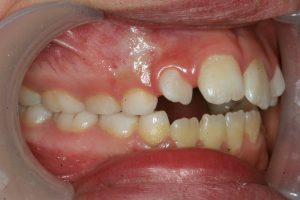 The utility arch is also valuable in controlling the available space for the incoming 3 teeth on either side of the incisors. These teeth will not need braces as they erupt without any interference or crowding through natural processes. The remaining permanent teeth are free to erupt into position. CM with her “Roman arch”, or U-shaped arch form, where her tongue, now enjoying adequate space, does not have to push the front teeth apart. 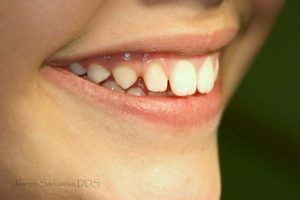 CM with her beautiful smile. 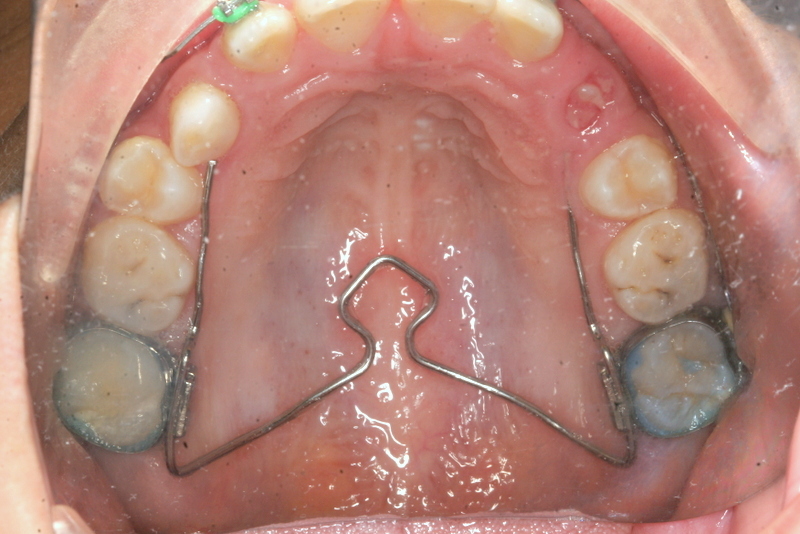 The tongue thrust will not re-appear provided the arches have been developed and the tongue is trained. 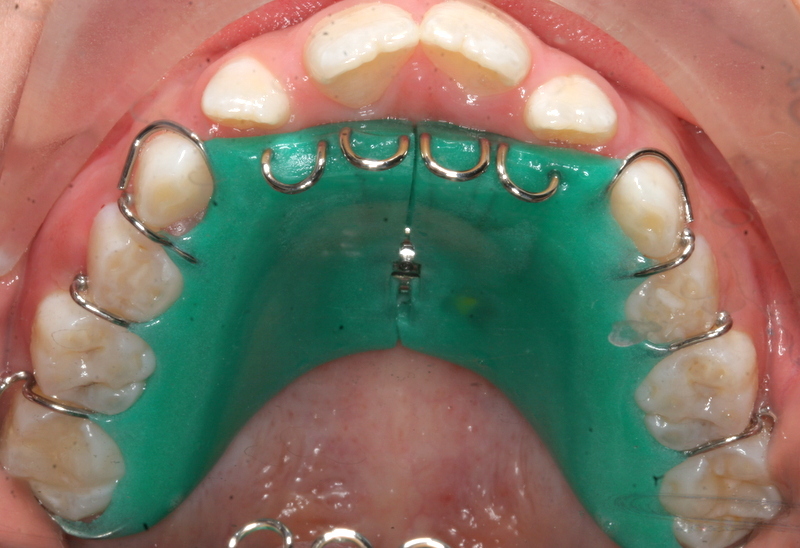 In case the tongue retains its “wrong programming”, the patient is referred to a myofunctional therapist.